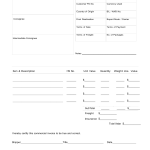 Download a commercial invoice template that may be used for international shipping to identify to customs agencies what the product is and how much is cost. This is important for some countries charge import taxes, VAT, etc. which may be carried to the receiver upon delivery. After filling-in the document with the details of the item(s) it should be signed and dated by the sender.